A vegetarian One Pot Coconut Noodle Soup that can be prepared in just 20 minutes and that makes for a perfect, healthy weeknight dinner. It can be served with any protein of your choice! Heat a medium no stick pot over medium heat. Add oil and cook onion for about 2 minutes, and then garlic for 1 minute, stirring occasionally. Do NOT let brown! 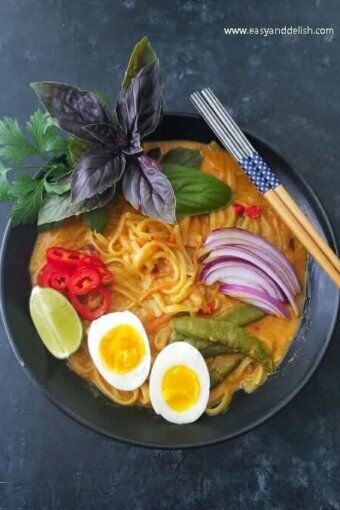 Stir in Thai red curry paste, turmeric if desired, canned coconut cream or milk, vegetable broth, soy sauce, and sugar. Bring to a simmer and add noodles. Let cook for about 4 minutes. Add snap peas, bell pepper, and carrot and let cook for about 3-4 minutes or until both noodles and vegetables are fully cooked. Remove from heat, and stir in lime juice as well as Thai basil and/or cilantro. Serve immediately by itself or with a protein of your choice. I served mine with soft-boiled eggs. Enjoy! If desired, this One Pot Coconut Noodle soup can be served with shrimp, ground chicken, or either soft or hard boiled eggs. To cook soft boiled eggs, boil water (enough to cover eggs) and gently place eggs into the pot. Let cook for about 6 1/2 to 8 minutes. Then, remove eggs from the pot and place them into a bowl filled with ice water. Let cool and peel them. Substitutions: You can replace coconut oil with vegetable oil. Ramen (not gluten-free) can be substituted for rice noodles (gluten-free). COOKING TIP: If you prefer a less soupy/saucy dish, you can use half the amount of coconut cream (or milk) and half of the amount of vegetable broth. However, in that case it is best to precook the noodles in water separately, because otherwise more liquid would be needed (since the noodles tend to absorb most of the liquids). Love comforting vegetarian soups? Try our Quick Lentil Coconut Curry.